Are you in a search for a 4G mobile under 5000 with useful features? Well, then you have come to the right place. 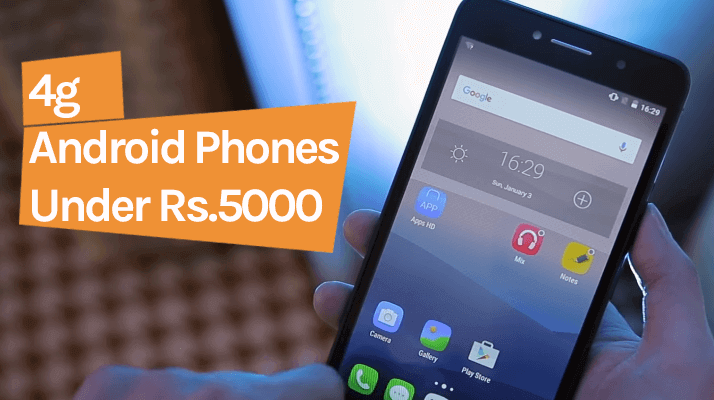 To help you take the right decision I have crafted an exclusive list of 4G Android smartphones which are available under 5000 rupees budget. Considering the price range do not expect high performance and fancy features, but you can look forward to the best value for money. In the year 2016, we have seen that the new standards for low budget mobiles have been redefined. Now features such as 4G LTE connectivity and HD display are considered as the standard feature which was once considered as premium. Overall it’s good for you as now you need to pay less for more features. Various different factors have been considered while creating this in-depth list. Price, performance, and battery power are few of the most important factors which I have considered. Though you can not expect to get hands on high-end features like the fingerprint scanner, dual LED flash, etc.consist, at such a low price but you can expect some value for money phones. I have also tried to make that this list consists of only those phones which have battery power more than 2000mAh. Some of them will also provide you with the decent rear camera, and some can even have 2GB ram. So without wasting any more time, scroll down, read the reviews and choose the perfect companion for yourself. 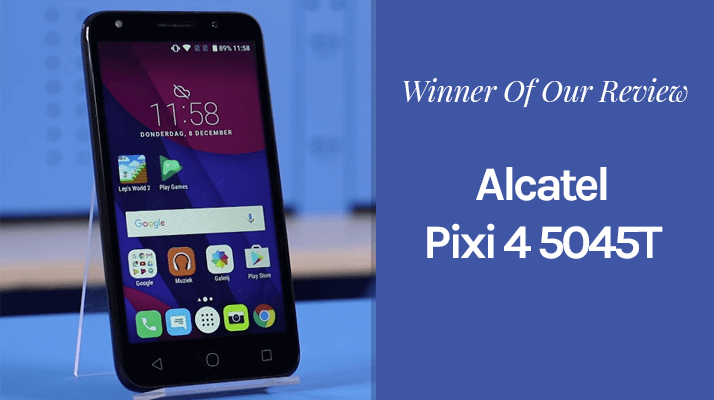 Alcatel Pixi 4 is one among very few 4g mobile under 5000 with 2gb ram which is worth every single penny. It doesn’t only look fabulous but also comes loaded with lots of powerful features. It has got a 5 inches TFT touchscreen with 854 x 480 pixels resolution and 196PPI pixel density. As far as my experience is concerned, the display was very responsive. I never faced any lags while scrolling down the app drawer with 30+ application icons. Furthermore, the display has support for 16million colors. Pixi 4 runs on Android Marshmallow operating system. This OS might seem too old to you, but in reality, marshmallow is a very stable version of Android, and thus you will never face any problem while using this phone. There’s one thing which you might not like about it is the pre-installed launcher app. But then this launcher app is not forced on it. You can use the options panel to customize it or remove it altogether. It comes with 2GB ram and 8GB internal storage. As for the connectivity is has got support for various bands of 4G, 3G network along with 2G, Edge, WiFi, and Bluetooth. It has got two micro sim card slots, and both of them supports 4G connectivity. Now let’s talk a bit about its camera. It has 8MP primary and 5MP selfie camera. The rear sensor has support for the panorama, HDR mode, geo-tagging and much more. The picture quality of the rear sensor is quite good, but that of the front sensor is not. When I took pictures with the front camera, they were bit dark and had a lack of clarity. The only thing which disappointed me a little bit is it’s 2000mAh battery. But amazingly the results were quite the opposite of what I expected. I thought the power wouldn’t last for more than 4 hours if I continuously play games or watch multimedia contents. Surprisingly it lasted for more than 7 hours. And according to the official sales page, the company says, Pixi 4 can withstand 12 hours of talk time on 2G, 11 hours on 3G network. Overall, after considering all it’s features and it’s ludicrously cheap price tag, I will definitely recommend it to you. It has got 2GB ram. The build quality and overall design are good. It supports 4G connectivity on both sim card slots. The battery has just 2000mAh power. Are you looking for a 13mp camera mobile under 5000? If that so then checks out Canvas MEGA E353 which runs on Android Lollipop OS. It was released back in November 2015 in India. It is currently available in two color variants, black and slate gray. It looks good, but I think it has way too much-curved corners. Because it’s width is 78.70mm, it is quite comfortable to carry in hand. It has got 5.5-inches HD display which offers a resolution of 720×1280 pixels and pixel density of 198PPI. It means now you can enjoy HD movies, videos and can even play HD games. And to make sure that your enjoyment is never hindered, it comes with 1GB ram and 1.4GHz octa-core MediaTek processor. This much horsepower is quite enough to help you carry out basic multitasking activities on this smartphone. As for the camera, it has hot 13MP primary and 5MP front sensor. The quality of the rear sensor is quite good and easily beats that of xiaomi redmi 3 which has a 16MP rear sensor. But you just cannot its picture quality with that of medium range smartphones. The front sensor offers quite decent selfie pics and comes with few image enhancement filters. It is dual sim android phone which supports 3G, 2G, edge, wifi and Bluetooth connectivity. I have included Canvas MEGA E353 on this list only because of its camera, and that’s why I’m so sorry to say that it doesn’t support 4G connectivity. It even has got an average 2820mAh battery which is quite sufficient for this mobile. But I would like to point it out that it doesn’t support fast charging. It has got a 13MP camera. Its battery power is quite decent, 2820mAh. Screen size is 5.5inches and offers HD resolution. The only downside is that it doesn’t support 4G. According to our review, Xolo Era 2 is the best volte phone under 5000 you can buy right now. It doesn’t only come with a superior build quality, but it also looks quite refreshing and modern when compared to other competitors in this list. The body is build up of decent quality plastic and has got smoothly curved corners. As far as colors are concerned, it is currently available in black, blue and golden color. It has got 5-inches (12.7 cm) TFT touchscreen with a resolution of 854 x 480. According to the company, the display is 30% brighter than the older model and thus helps to reduce strains on eyes. As I have already said, it comes with 1GB ram and to further boost its performance it comes with 1.3GHz quad-core processor. It is one of the most responsive ultra-budget mobiles I have used. I mean you will never face any flickers or lags while watching any multimedia content or while browsing the internet. It even has 8GB internal storage which you can apparently extend up to 32Gb using microSD card. Furthermore, it has got 5MP primary and secondary camera. The picture quality offered by both of the sensors are decent, but you should not have high expectations at such a low price point. Xolo Era 2 comes with 4P Largan Lens which ensures you are able to click high-quality pics every time even in low light environment. To even enhance the picture quality, both cameras are assisted with LED flashlight. Now let’s discuss a bit about the most important point, connectivity. This smartphone has got dual SIM card slot, and both of them supports 4G LTE. The first sim card slot has support for VoLTE which means you can easily use Jio Sims and can do calling, video chatting and messaging without installing any additional application. As for the battery, it comes with 2350 mAh non-removable battery. Launched back in September 2014, this budget Android smartphone is available in the Indian market for Rs.3,862 only. You can purchase it from the online retailer like Flipkart, snapdeal as well as Amazon. It has got an excellent performance and specification even being available at such a low price. Intex Aqua Star features 5 inch HD IPS Multi-touch display and comes with a 720px × 1280px resolution. At the core, it has MediaTek Quad-core processor which gives this phone processing speed of 1GHz. Furthermore, it is coupled with 1GB of RAM and 8GB internal storage so as to offer enhanced user experience. The internal storage can be expanded up to 128GB via MicroSD cards. The inbuilt storage is sufficient enough for a broad range of multimedia content and applications. Coming to the optics, the phone sports an 8-megapixel primary sensor with LED flash. It even has a 2-megapixel front facing camera which offers decent quality selfie pictures. In order to give you a smooth Gaming and video playback experience, it comes integrated with Mali T720 Graphical processing unit. The most remarkable feature of Intex Aqua Star is its iData Saver feature. This functionality is powered by Opera Max and is said to reduce the data consumption by up to 50 percent. You must also note that it is a Dual-SIM Android phone and comes with supports both 3G and 4G LTE service. It runs Android 5.1 Lollipop operating system which might seem to be quite old, but that’s OK because you will rarely face any sorts of lags or hang in this mobile. In addition to all these features, it comes loaded with 2000mAh battery that can run up to 5 hours of talk time and 150 hours of standby time. As for connectivity options, you get Wifi, GPS, Bluetooth, GPRS, and 3G/4G. As far as color options are concerned, it is available in three different colors (White, Grey, and Black). Lava is an Indian company that offers mobile and tablets, and they launched Lava A76 smartphone back in April 2016. In the Indian market, it is priced at just Rs. 4549. The phone offers a range of nifty features which make sure you have a smooth user experience. The phone features 4.5-inch touch sensitive display. It is powered by a 1.5 GHz quad-core SC9830A processor combined with 1GB of RAM. Lava A76 is packed with 8 GB internal storage which can be easily expanded up to 32 GB via MicroSD card. For capturing the memories, it sports 5-megapixel primary camera and a 0.3-megapixel front sensor for selfies. The camera features digital zoom, HDR mode, photo timer, and grid. One another great feature of this phone is its ability to respond to various actions. For example, you can flip the device to mute it. This feature comes really handy when you are in a meeting or class, and you get a phone call. Now you just need to flip the device, and it will mute the volume. The Lava A76 is a dual-SIM smartphone with support 4G LTE connectivity. This means that you can enjoy Jio internet connectivity without paying a premium for other mid-range smartphones. You should note that 4G is enabled only for the first sim slot. So now you can enjoy the videos in admirable quality without any glitches or download the favorite music or movies with high-speed 4G. As far as the Operating system is concerned, it runs Android 5.1 Lollipop OS. As for battery power, it comes with 1850 mAh non-removable battery. The battery backup is slightly inferior when compared to other competitors on this list, but you can expect talk time up to 4 hours. It also supports Micro USB, GPS, Wi-fi and Bluetooth Connectivity. Xolo Era2 is the second version of Xolo Era, and it is one among the 5 inches 4G Android mobile phones which are available in 5000 rupees. It comes with better features and great looks when compared to its predecessor. Moreover, it is one of the hottest selling smartphones on Snapdeal with an average user rating of 4 out of 5. It is priced at Rs.4,777 at the online store. Also, offers the Jio’s welcome offer featuring unlimited data and voice calling. The phone has some decent specification for the price you get. The Xolo Era2 carries 5-inch IPS HD screen comes with 854x 480-pixel resolution and Gorilla Glass Protection. Under the hood, it has a 1.3 GHZ quad-core processor coupled with 1GB of RAM. The device contains 8GB onboard storage which you can easily further expand up to 32GB. The Camera is capable of recording HD videos. The 5- megapixel rear camera is equipped with f/2.0 aperture, 4P large lens, LED flash for low light photography. It packs with 5 MP Selfie Camera with Front Flash. The Xolo Era2 runs latest Android 6.0 Marshmallow supports 4G LTE service along with 3G and 2G.The connectivity options offered by the smartphone include dual-SIM support, GPS, Wi-fi, Bluetooth. It is powered by 2350 mAh Lithium Ion battery which is enough to hold a charge for a day. Karbon Quattro L45 is probably the best dual sim phone under 5000 from Karbon which is an Indian brand. It is an affordable Android phone with decent performance. Although it comes with a relatively smaller screen size but at the price at which it is available, you get decent performance. Furthermore, it also has a lightweight body which makes it really comfortable to handle. It is the latest budget smartphone in the market. It is available in online store and nearby mobile stores. The device features 4.5-inch IPS HD display having a resolution of 480×854 pixel. The phone comes in a black colored body that weighs 118 grams. It is powered by a 1GHz MediaTek quad-core processor having a clock speed of 1GHz. It is loaded with 1GB of RAM that can easily handle multitasking. For storing your data, images, and videos, the device comes with an 8 GB inbuilt storage which using microSD card you can extend it up to 32GB. The highlight of this phone is front flash, which makes it an excellent choice for selfie lovers. The device sports a 5MP primary camera with autofocus and LED flash and accompanied by 2 MP front facing camera which also features LED flash. On the back, it is packed with 1,800 mAh Li-ion battery which can last a day with moderate usage. Connectivity option features dual-SiM, 4G LTE,wi-fi,Bluetooth,GPS,microUSB 2.0.In the box, Karbonn Quattro includes headset, Flip cover, charger and USB cable.Including all of these features, it is worth according to price. Videocon company launched Videocon Graphite 1 V45ED smartphone in June 2016. It measures 4.5-inch TFT capacitive touchscreen with a resolution of 480×854 pixels. This phone is not protected by a scratch resistant display. The device is powered by a 1 GHz Quad core MediaTek MT6735M processor which is fast enough to handle games and multitasking. It has even got a graphics processor which makes sure that you never face any glitches while playing games or watching various multimedia contents. Furthermore, it has got 1GB of RAM and 8GB onboard storage which can be easily extended up to 64GB via microSD card. In camera section, it sports a 5-megapixel primary shooter camera which features HDR mode, digital zoom, paranormal mode. It can even record high-quality videos. It also has a 3-megapixel front facing camera, that is capable of shooting good selfies. Videocon Graphite 1 V45ED is 10.26 mm thick and weighs 13.3 gram. It runs on Android v6.0 Marshmallow operating system and has got support for 4G LTE service. The phone also includes other connectivity features such as Wi-fi, Bluetooth, GPS. It is powered by 2000mAh removable battery which is enough to hold a charge for a day. The LYf F8 VoLTE support smartphone is another low budget smartphone under RS.5000. The phone price in the Indian market is Rs.4,700. It is quite attractive. The LYF Flame8 has a nice glossy finish and feels sturdy in built quality. The device comes with a ‘gel case’ which is appreciable in this price segment. The budget phone comes with a 4.5-inch touchscreen display with a resolution of 480 pixels. It offers pure Android like experience including pre-installed apps. The phone also comes with LYF Care for support and NetVelocity app for checking Internet Speed. The phone doesn’t lag and even multitasking with the 1.1 GHZ quad-core Snapdragon 210 processor coupled with 1GB of RAM. It contains 4 GB internal inbuilt storage. The phone sports an 8-megapixel rear camera with LED Flash and a 5-megapixel front camera for selfies. The camera of LYF is decent enough for this price range, but the front facing camera is disappointing. The 4G VoLTE support phones packs in a 2000mAh battery which comes with decent battery backup. The phone’s battery lasts a full day on the moderate usage. It takes more than 2 hours to charge the battery fully, but it is not the problem because the battery doesn’t drop quickly. The ZTE Blade Qlux is one among the most affordable smartphone present in Indian market with LTE capabilities. It was launched in July 2016 exclusively on Amazon India and is currently priced at RS, 4,980. Now it is also available on other online stores. With this mobile, you can do multitasking with ease. You can play games and manage multiple office apps. All thanks go to its powerful 1.3 GHz MediaTek MTK6732M processor. It comes packed with 8 GB internal onboard storage, which can be extended up to 32GB via microSD card. Furthermore, to offer smooth performance, it comes with 1GB ram. It sports 4.5-inch FWVGA(854×400 pixel) IPS display. To capture images and videos, it comes with 8-megapixel autofocus snapper on the back with LED flash and a 5-megapixel selfie camera on the front. It supports dual sim and it runs on Android KitKat v4.0 operating system which can be upgradable up to Lolipop version. The device has 2,200 mAh removable battery which offers talk time up to 12 hours and up to 250 hours on standby. Connectivity option feature 3G, 4G LTE service, Wi-fi, Radio, GPS, and Bluetooth. There are many 4G smartphones available in the market on a small budget, and Lenovo A2010 smartphone is one of them. This device runs on old Android v5.1 Lollipop operating system and comes with 4G support. It is available on almost every online e-commerce store in India and is currently priced at Rs. 4,990. The Lenovo A2010 carries 4.5-inch FWVGA (480×854) display powered. Furthermore, it comes loaded with 1GHZ MediaTek MT6735m 64-bit quad-core processor which is coupled with 1 GB of RAM and 8 GB inbuilt storage. The phone memory is expandable up to 32GB. It is enough for storing the download images and videos. Coming to the Optics, the camera quality of this smartphone is quite impressive, which sports 5- a megapixel rear camera with LED flash and 2-megapixel front fixed focus cameras. This Dual-SIM(GSM+GSM) smartphone supports two available LTE brands in India-FDD 1800 Mhz(Band 3) and TDD2300MHz(Brand40). Connectivity option includes Bluetooth, Wi-fi, FM radio, 4G. The phone comes packed with a 2000mAh replaceable battery. Lenovo A2010 has an advantage on battery life as the low-resolution displays consume less power. The Indian brand smartphone InFocus Bingo 21 is another budget smartphone under Rs.5000. It is good looking smartphone priced at Rs. 4,999 in the online e-commerce store. It comes with three different color variant. According to the feature, the phone is worthy according to budget. The Dual-Sim supporting phone is powered by a 1.5 GHz quad-core Shark L SoC processor. It is one among the very few 2gb ram mobile under 5000 rs. You can play games and watch videos without any hiccups because of its high processor and Ram. The device is packed with 8 GB internal onboard storage which is expandable up to 32GB. The Smartphone has 4.5-inch FWVGA(850×480 pixel) display with On-cell touch technology. The phone’s camera features 8-megapixel autofocus rear camera with f/2.2 aperture, LED Flash. It also has a 5-megapixel front facing sensor with flash features. The Infocus bingo 21 runs Android v5.1 Lollipop operating system. On the back, packs a 2300mAh battery which will last for a day. The Infocus Bingo, The Phone Connectivity option, include 4G LTE(with Band 40), wi-fi, Micro USB, GPS and a 3.55 mm audio jack. The disappointing thing of Swipe Elite 2 is its battery which is just 1900 mAh. For a 4G smartphone, it is quite less. The phone feature connectivity option which includes GPRS,3G, and 4G(LTE), wi-fi Hotspot, Micro USB 2.0, Bluetooth, GPS. According to the feature, the phone got a good display and better processor when looking at the price. The Android 5.1 Lollipop based Elite 2 mobile is a dual-SIM supporting smartphone which carries a 4.5 inch IPS HD(960×540 pixels) display. The handset runs 1.3GHZ 64-bit quad-core MediaTek processor coupled with 1 GB of RAM. It includes the 8GB inbuilt storage which you can further extend up to 32 GB via microSD card for capturing images and videos. As far as the camera is concerned, it sports an 8-megapixel autofocus primary sensor with LED Flash and a 5-megapixel front facing sensor for selfie lovers. The phone is available in black color at just Rs.4,666. The Elite 2 supports both LTE bands in India- FDD 1800MHZ(Band 3) and TDD 2300MHZ(Band 40). This also means that you can enjoy Jio 4G connectivity without any issue. Support for dual sim and 4G connectivity. Look is OK but lots of improvement could be done. The InFocus Bingo 21 offers you much than what you expect from it. In my view, this is the best 4g mobile under Rs 5000. I have used this phone personally, and I wasn’t much expected from this device, but it changes my exception because of its features. The additional characteristics of this smartphone are its 2GB RAM and high-performance processor which is suitable for playing high definition games without any hiccups. As Infocus is a new brand in the India, I would like to suggest to the people who are unaware of Infocus brand, and it is really a good smartphone that doesn’t let you down after buying this smartphone. It comes in just at Rs.4,999 and currently available in the online e-commerce store. i was looking to buy a mobile under 5k, thanks for your amazing list of mobiles under 5000.